Yesterday I drove to Albuquerque airport. As I was driving south of Espanola, I saw a few pilgrims walking along the side of the road, heading for the Santuario de Chimayo for Good Friday. I have, in years past, seen many, many pilgrims making this walk. I'm sure today will find many more along those roadsides. 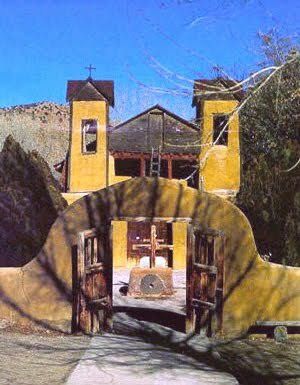 If you aren't familiar with the Santuario, it is considered by many to be comparable to Lourdes. This history of this privately built chapel involves beliefs that the dirt there has healing powers. There is a room there full of crutches and other testimonies from those who have found relief from the magical combination of dirt and beliefs. While I am neither Catholic or religious, I have always enjoyed the mystery and ambiance there. If you find yourself in Chimayo, be sure to visit Leona's burrito wagon and buy "holy" chile across the street...yum! 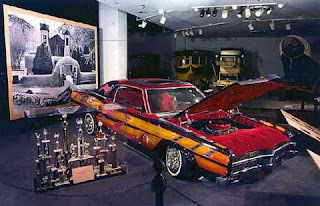 Martie: I was going through Espanola one day and there were dozens of low rider cars -- must have been a Sunday. I'll have to visit Leona's burrito wagon. New Mexico has some of the greatest cuisine in the world. I didn't know that about the Smithsonian. I would always take my anthro class to Chimayo and the church, then up to Truchas, Taos. Some days I feel like I need a whole bucket of their dirt to get by. -- Jack. Jack: I'm laughing to think of you needing an entire bucket of dirt...thanks for that visual. My friend Irvin Trujillo (Centinela Traditional Arts) of Chimayo also has his weavings in the Smithsonian. In fact, he was honored as a fellow of the National Endowment of the Arts in 2007. The work he and his wife Lisa do is at the top of the game in both contemporary and traditional Spanish weaving traditions. When I was still weaving, I was honored to be able to sell my work in their studio. Nice photo of this beautiful spot. Anything called Burrito Wagon bears a visit!! Thanks for the info.